Not to be outdone by distinguished competitor Game Informer's cover reveal of BioShock 2's Big Sister, GamePro has given us our first third-person look at the star of the sequel, the new Big Daddy. The July issue of the mag touts a deep dive into 2K Games' sequel to the original BioShock, offering "first *real* gameplay and story details," which would lead us to believe everything we've seen and heard about the game to be falsehoods and fabrications. Bummer! 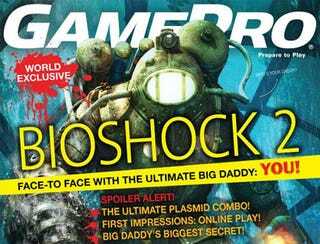 GamePro also promises "spoiler alert" caliber details, revealing the "ultimate plasmid combo," first impressions of BioShock 2's online modes and Big Daddy's "biggest secret." Presumably we'll have to wait for months to determine exactly how the game's fun factor ranks. Other spoiler alert worthy details—don't look! you'll ruin everything!—include a write-up on BioShock 2's main villain (which is not the Big Sister, GamePro says), impressions of multiplayer modes set in a time period before the original BioShock, and much, much more.